Chief James A. Garfield. 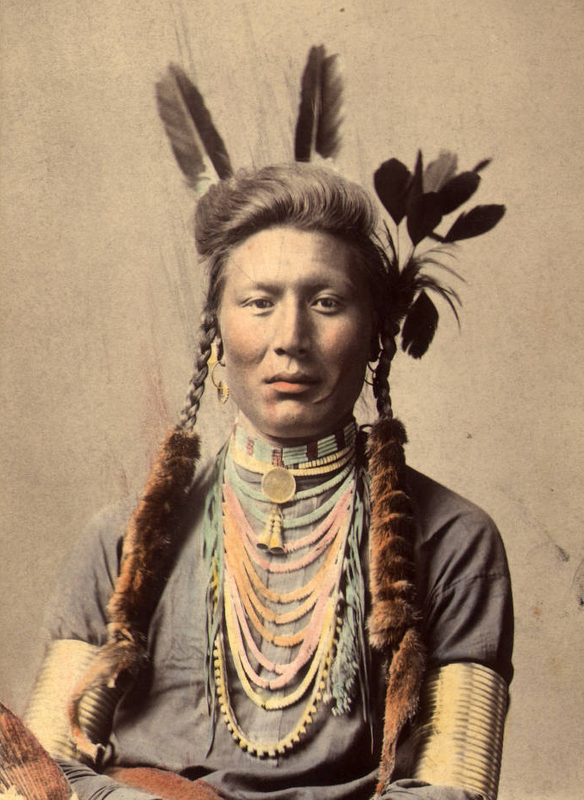 Jicarilla Apache. 1899. Photo by William Henry Jackson. Source - Montana State University Library. As a filmmaker, I am drawn to images. My first love of film came from old black and white movies by world cinema auteurs like the jarring works of Bergman, Eisenstein, Bunuel, Lang, Dreyer, Ozu and other great masters I will stop name-dropping. For a while in college, it felt almost like cheating to watch a film made in color. As I grew older, I accepted color and now find it hard to stick to a monochrome diet. Life seems too resplendent for just one tone. While making Moses on the Mesa, a film about a German-Jewish immigrant who fell in love with a Native-American woman and became governor of her tribe of Acoma Pueblo in New Mexico in the late 1800s, I developed a passion for researching old photographs of indigenous people. They were black and white photos of a beautiful mystical people, and it felt inconceivable that anyone would want to exterminate them from this continent as a conscious policy stretching over hundreds of years. It just seemed so barbaric and inhumane. 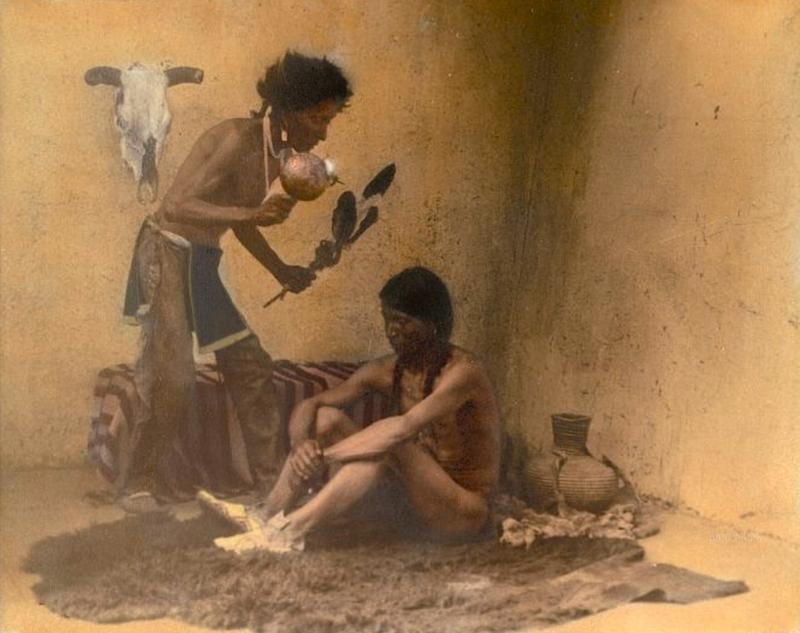 Delving deeper into the research, I started coming across colorized photos of these first Americans. In them the people started to come to life even more. Looking at them I see regular people but also royalty. They are in a way no different than historical portraits of European kings, queens and nobility. Except that not only do they show majestic regalia, but also strong, natural faces rather than the weak, powdered gazes of the often-interbred rulers from across the ocean that brought their demise. Many of the photographs I found were colored by hand, as color film was only the domain of experimentalists until 1930s (thanks, Kodachrome!) 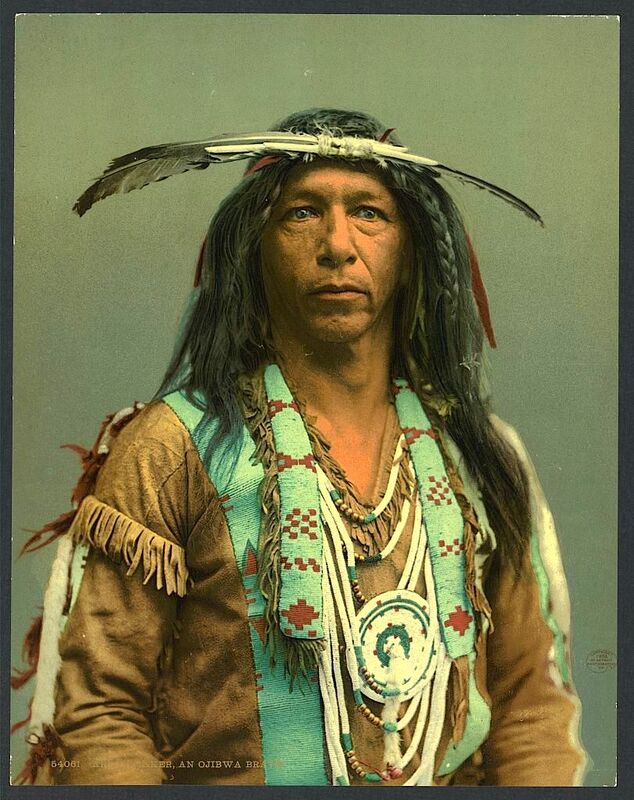 Painting on black and white prints was an art in and of itself, and many of the colorized photos exhibit true talent which preserved for us the truer likeness of the people many a hundred years ago thought were vanishing. Of course, Native Americans have not vanished despite the harrowing efforts of so many. They are growing stronger as a people, but a way of life they left behind is often only found in these photos. 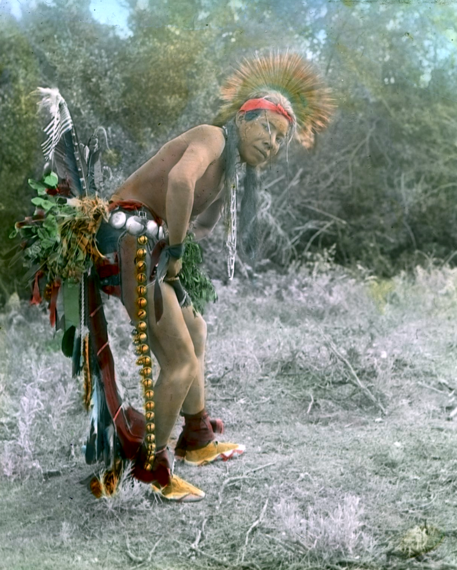 Please enjoy this first collection of colorized photos. If you like them, you can find many more at our historical and photographic archive here on Facebook. We are working on turning our award-winning film Moses on the Mesa into a television series that's based on first-hand accounts of life in the Wild West with a strong focus on indigenous culture and history. Be on the lookout for that soon. 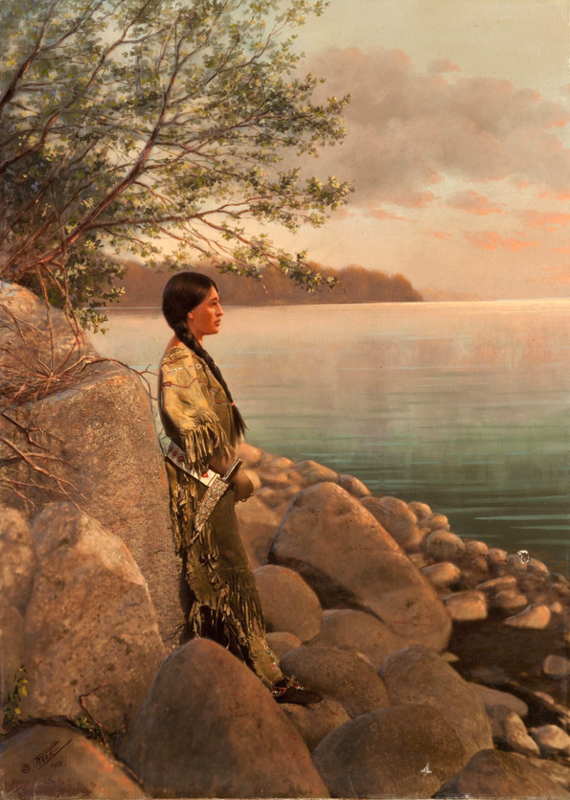 Handpainted print of a young woman by the river. Early 1900s. Photo by Roland W. Reed. Source - Denver Museum of Nature and Science. "In Summer". Kiowa. 1898. Photo by F.A. Rinehart. Source - Boston Public Library. 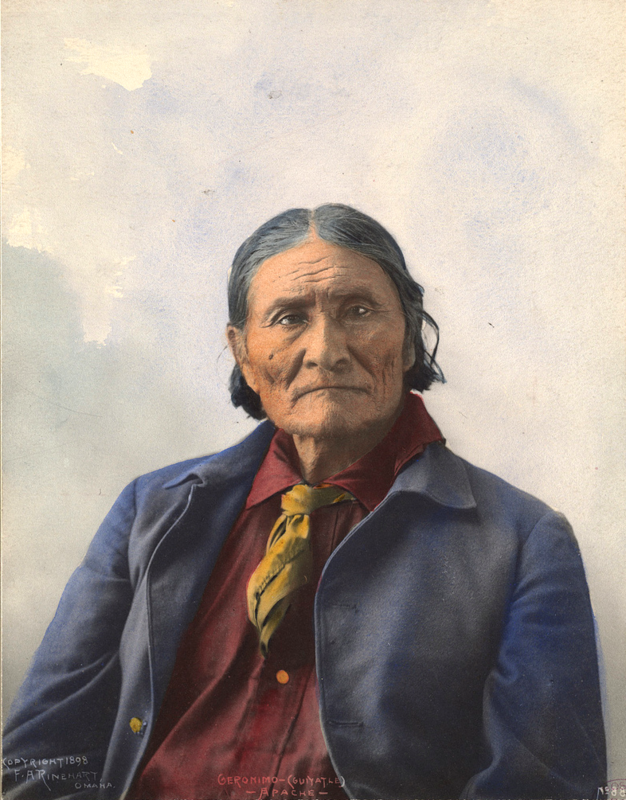 Geronimo (Goyaałé). Apache. 1898. Photo by F.A. Rinehart. Omaha, Nebraska. Source - Boston Public Library. 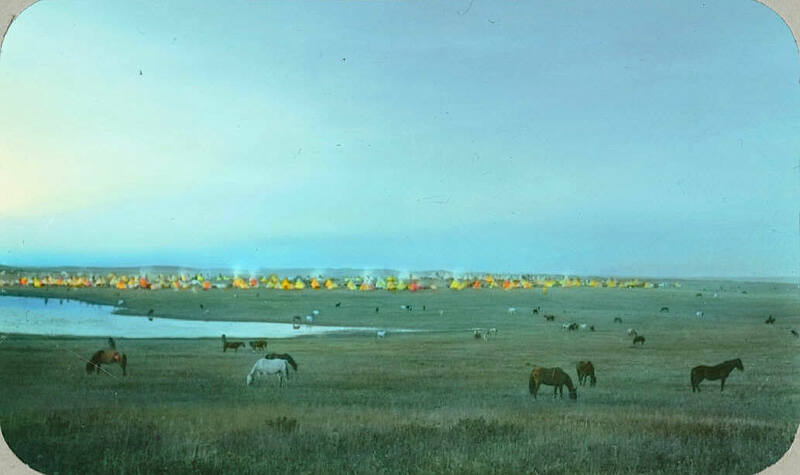 Blackfeet tribal camp with grazing horses. Montana. Early 1900s. Glass lantern slide by Walter McClintock. 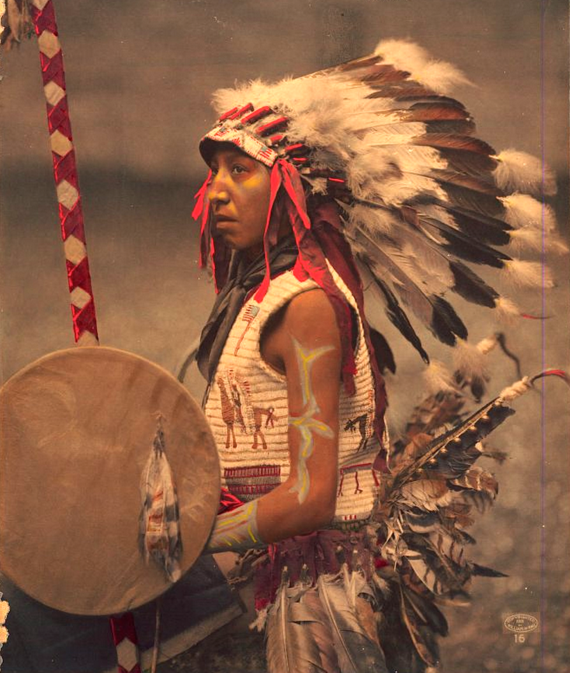 Source -Yale Collection of Western Americana, Beinecke Rare Book and Manuscript Library. Bone Necklace. 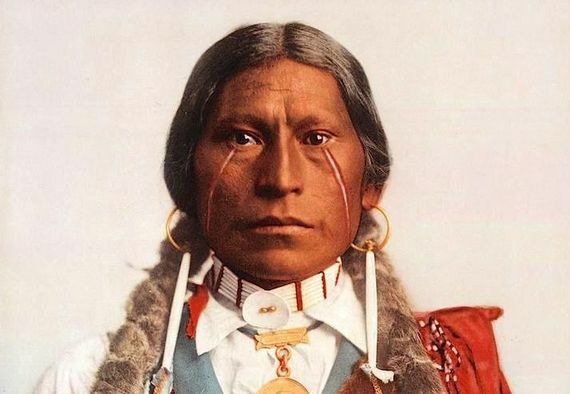 Oglala Lakota Chief. 1899. Photo by Heyn Photo. Source - Library of Congress. 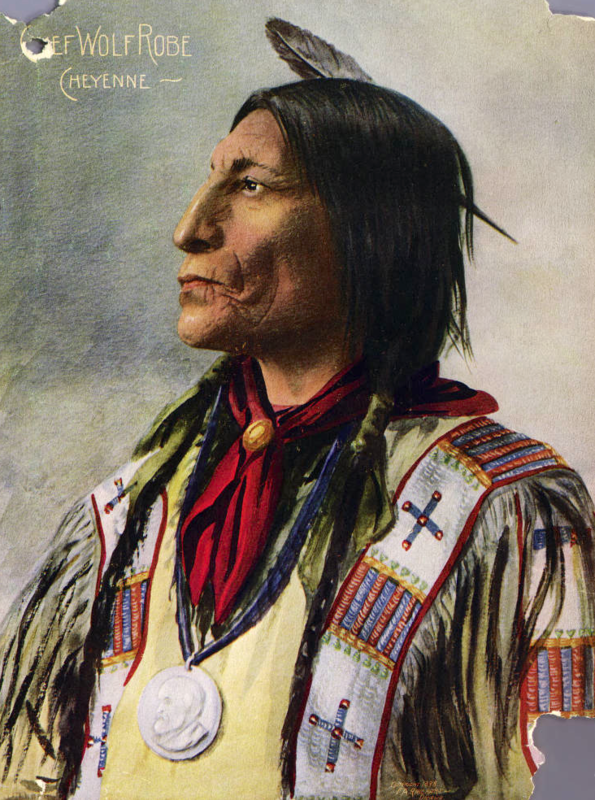 Charles American Horse (the son of Chief American Horse). 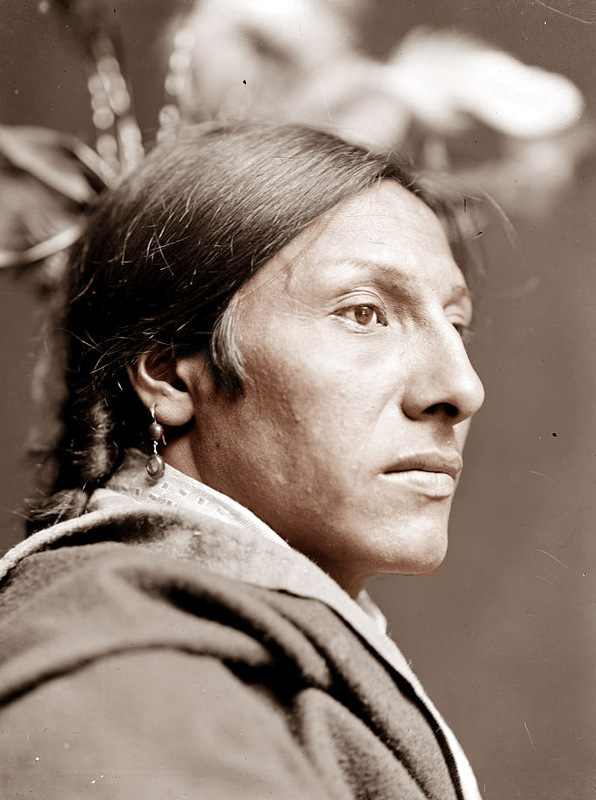 Oglala Lakota. 1901. Photo by William Herman Rau. Source - Princeton Digital Library. 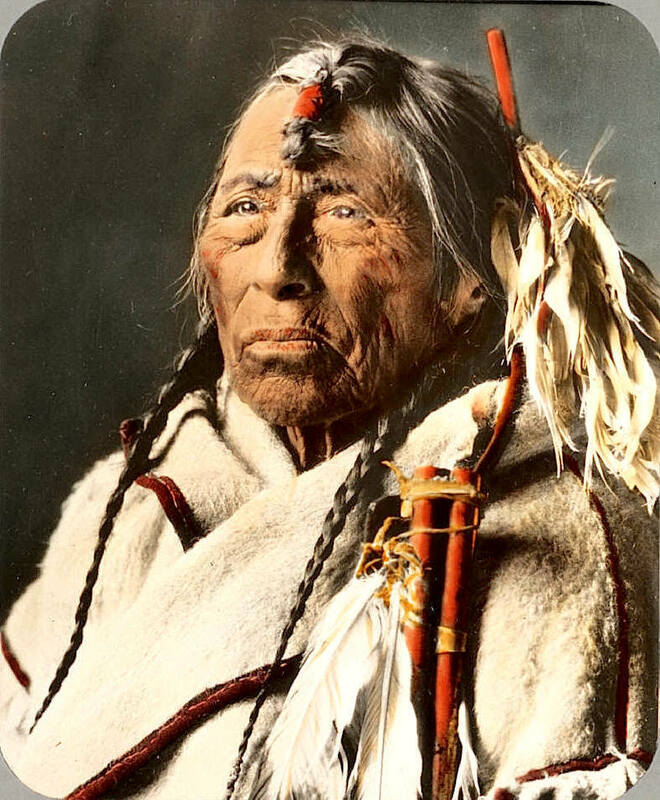 Cheyenne Chief Wolf Robe. Color halftone reproduction of a painting from a F. A. Rinehart photograph. 1898. 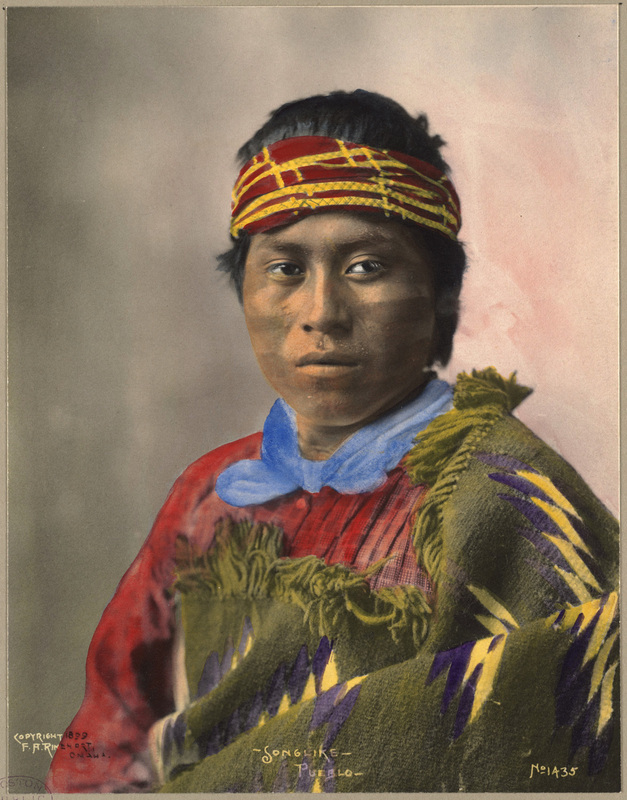 Source - Denver Public Library Digital Collections. A Crow dancer. Early 1900s. Photo by Richard Throssel. Source - University of Wyoming, American Heritage Center. Amos Two Bulls. 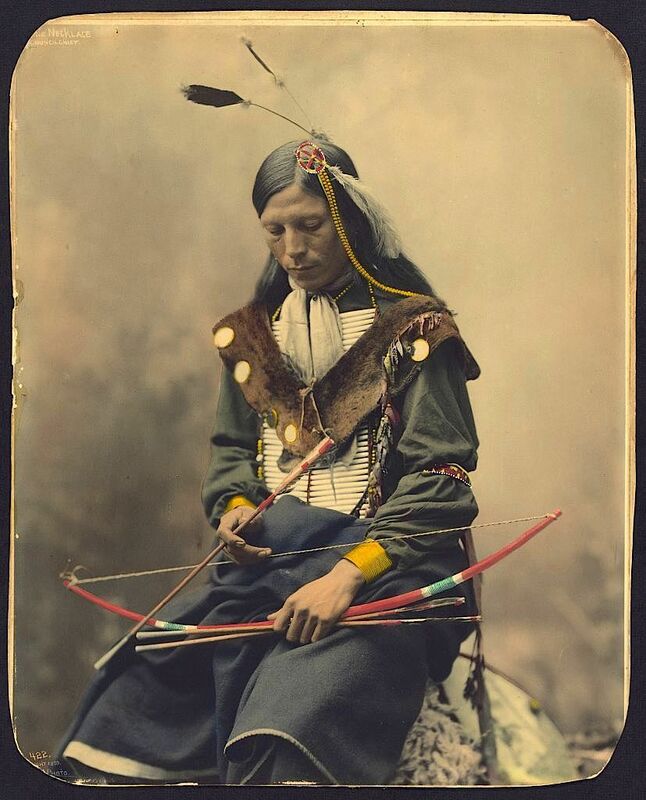 Lakota. Photo by Gertrude Käsebier. 1900. Source - Library of Congress. 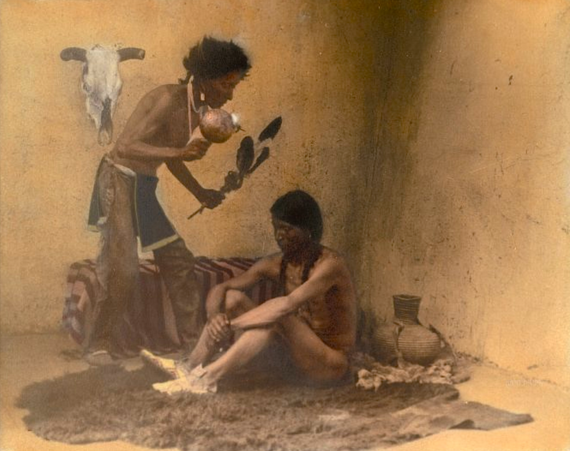 A medicine man with patient. Taos Pueblo, New Mexico. 1905. Photo by Carl Moon. Source - Huntington Digital Library. 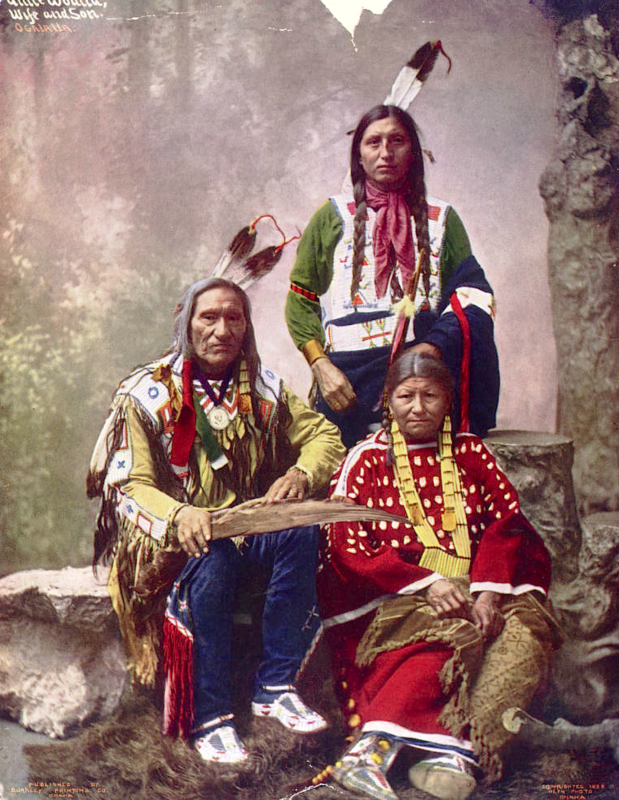 Chief Little Wound and family. 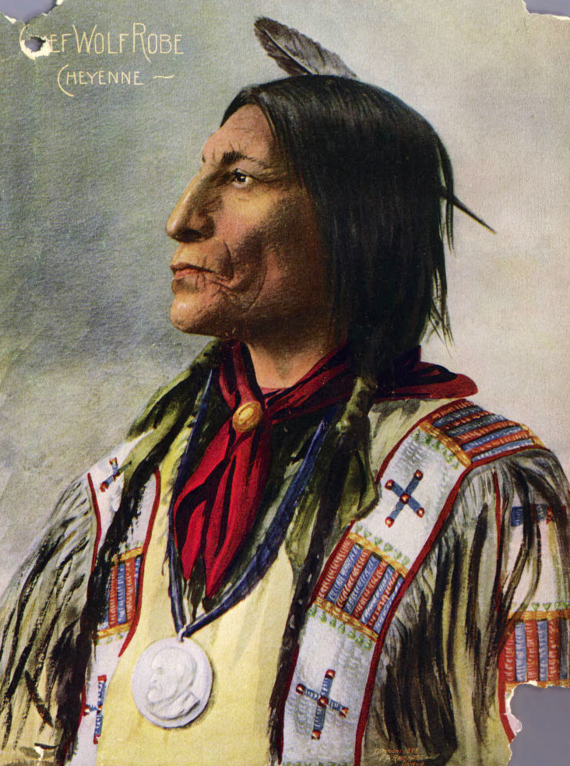 Oglala Lakota. 1899. Photo by Heyn Photo. Source - Denver Public Library Digital Collections. Eagle Arrow. 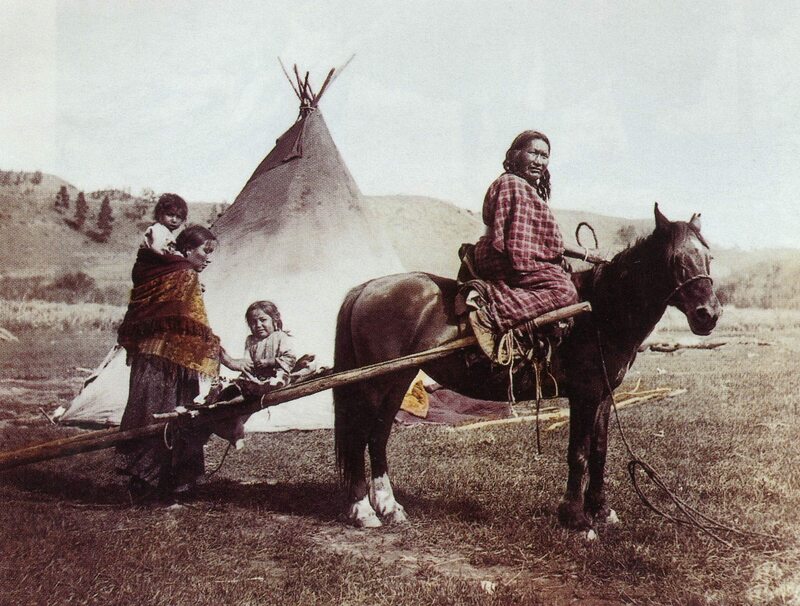 A Siksika man. Montana. Early 1900s. Glass lantern slide by Walter McClintock. 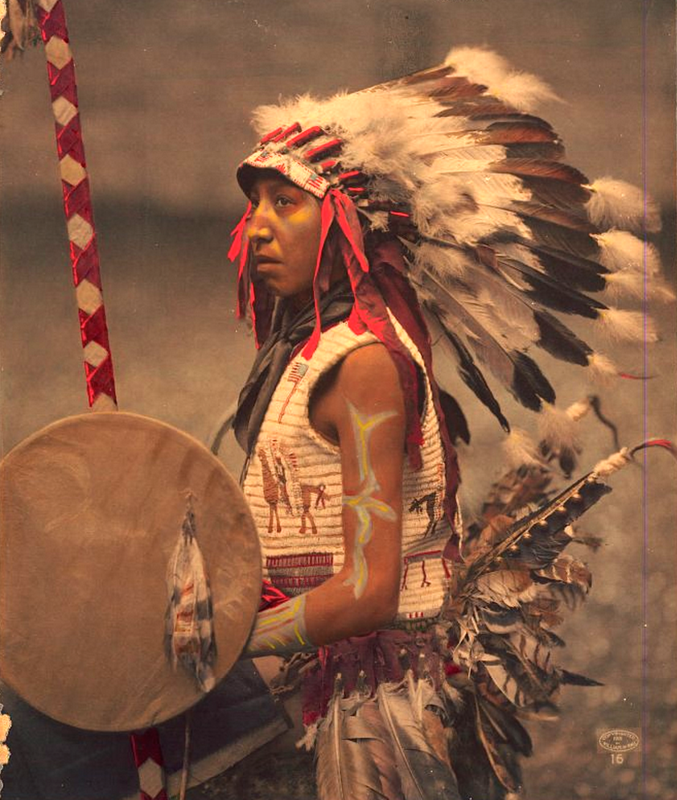 Source -Yale Collection of Western Americana, Beinecke Rare Book and Manuscript Library. 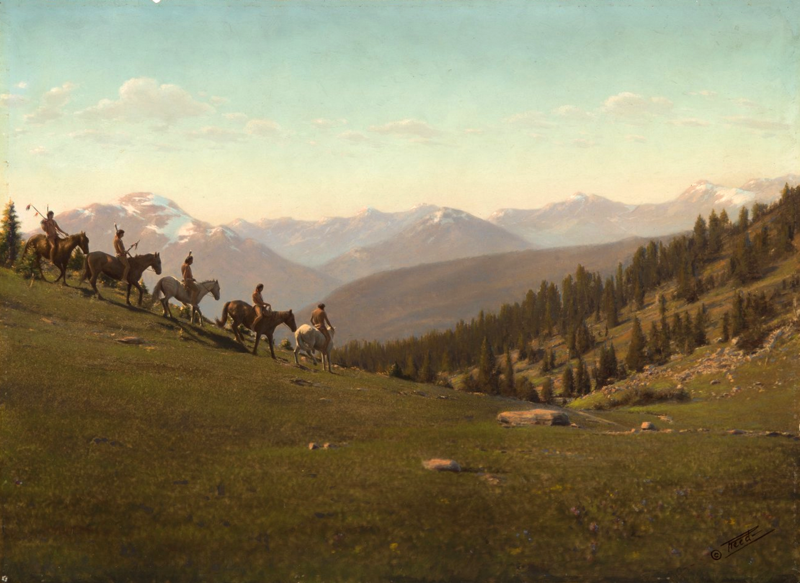 Handpainted print depicting five riders going downhill in Montana. Early 1900s. Photo by Roland W. Reed. Source - Denver Museum of Nature and Science . Strong Left Hand and family. Northern Cheyenne Reservation. 1906. Photo by Julia Tuell. Source - Buzz Tuell, Tuell Pioneer Photography. Minnehaha. 1904. Photochrom print by the Detroit Photographic Co. Source - Library of Congress. 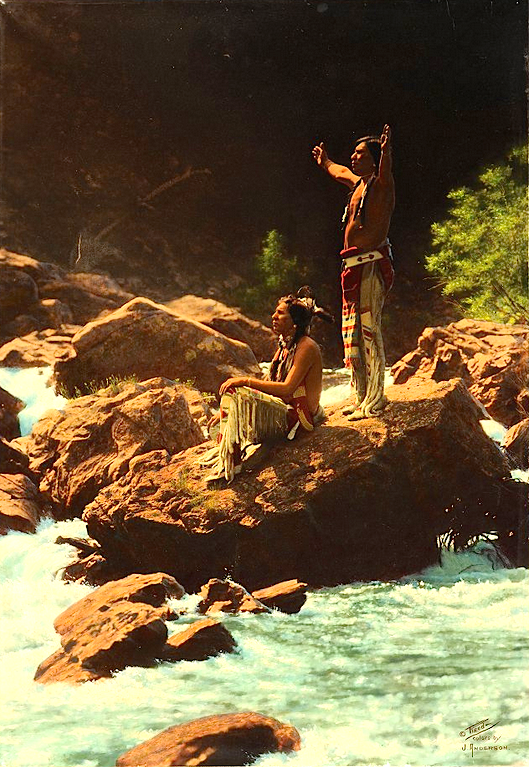 Piegan men giving prayer to the Thunderbird near a river in Montana. 1912. Photo by Roland W. Reed. Source - Denver Museum of Nature and Science. Old Coyote (aka Yellow Dog). Crow. Original photo circa 1879 (color tinted circa 1910). Source - Denver Public Library Digital Collections. Thunder Tipi of Brings-Down-The-Sun. 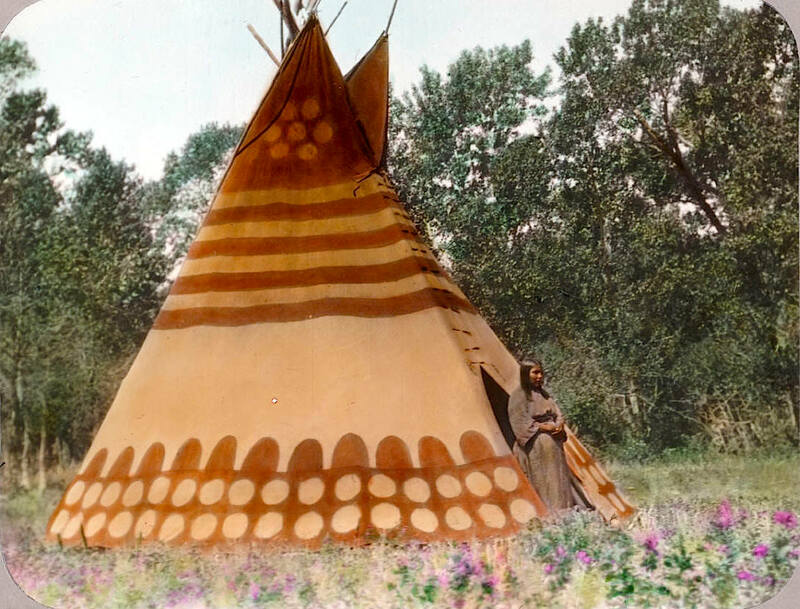 Blackfoot camp. Early 1900s. Glass lantern slide by Walter McClintock. 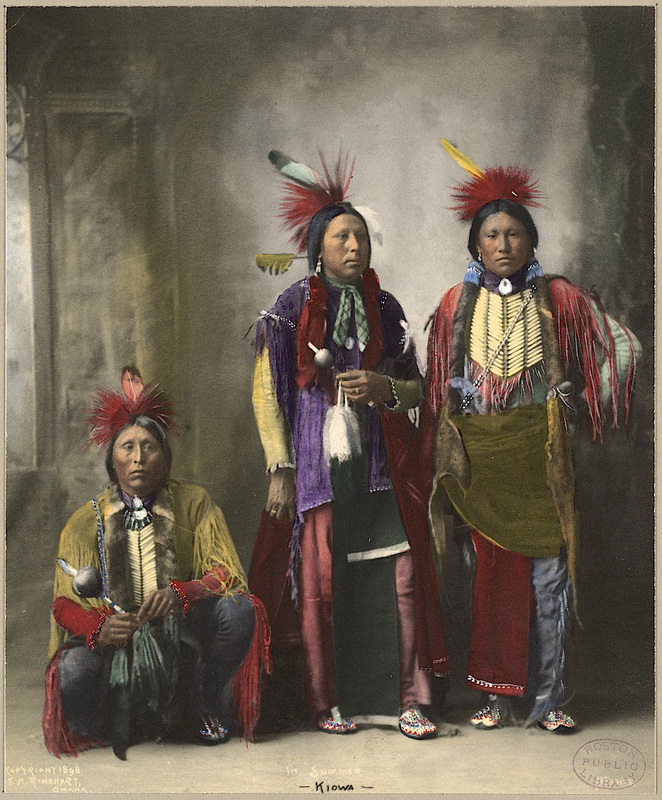 Source -Yale Collection of Western Americana, Beinecke Rare Book and Manuscript Library. 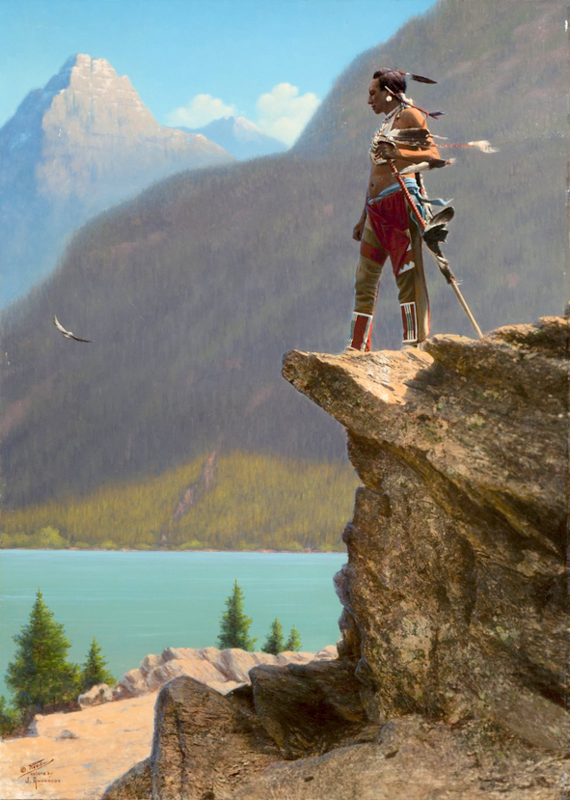 Arrowmaker, an Ojibwe man. 1903. Photochrom print by the Detroit Photographic Co. Source - Library of Congress. Acoma pueblo. New Mexico. Early 1900s. Photo by Chicago Transparency Company. 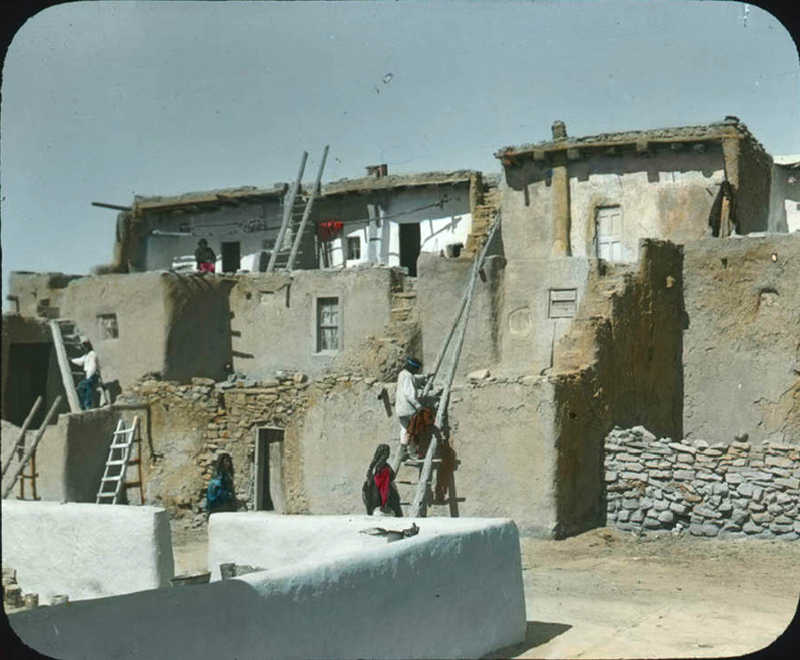 Source - Palace of the Governors Archives. New Mexico History Museum. 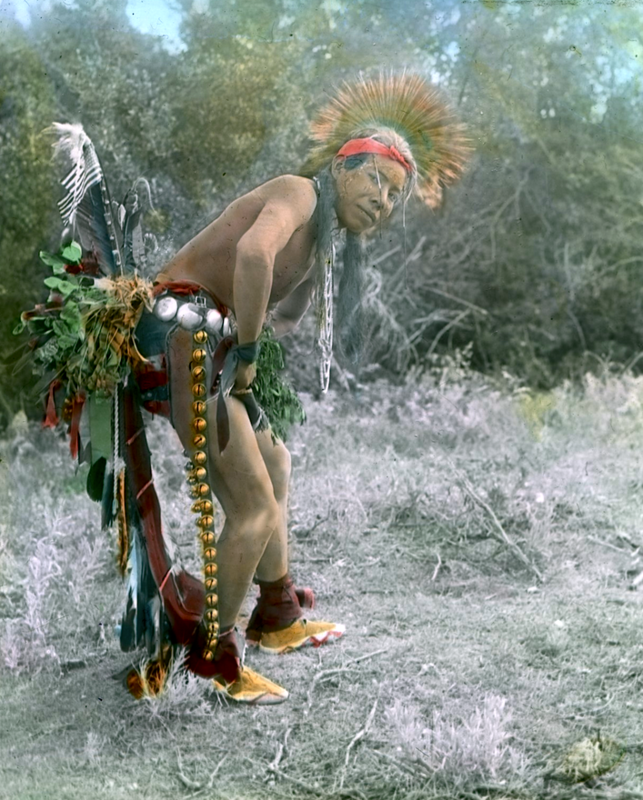 "Songlike", a Pueblo man, 1899. Photo by F.A. Rinehart. Source - Boston Public Library. Northern Plains man on an overlook. Montana. Early 1900s. 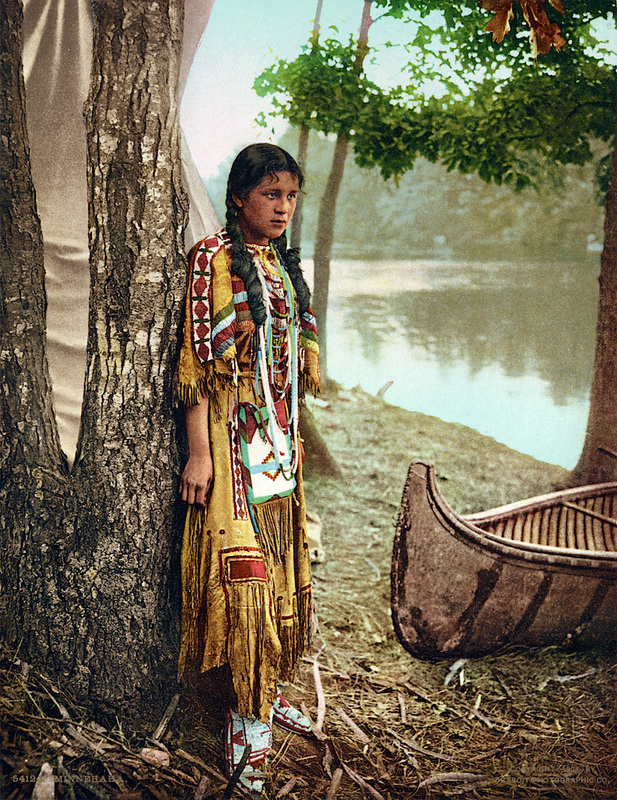 Hand-colored photo by Roland W. Reed. Source - Denver Museum of Nature and Science.